The functional charm and elegance of this simple, study door complements the ranch or western theme of this lovely home. The windows set in the top half of this paneled door opens the interior to admit light into the home. The decorative molding or sticking of the bottom panels creates a traditional look. The jambs, head, and sill are designed to enhance to overall effect of historical flair and solidity. 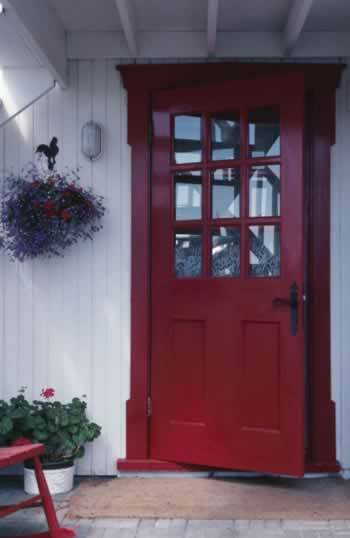 Set against the white paneling of the exterior and framework of the upper story frame, the red door really pops out. When you add complementary accessories such as the flowerpots and red rocking chair, the entire look pulls together with flair. Period hardware can make all the difference with a door like this. And the metallic iron plate and lever finish the artistic effect that makes this set a winner.